The costs of maintaining a sclerotic, cartel-state Status Quo infected with incurable diminishing returns eventually exceed the carrying capacity of the real economy and the Status Quo collapses in a heap. 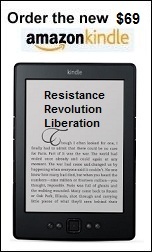 On the surface, the Status Quo appears stable, if not quite healthy. This stability is illusory, however, for the Status Quo has a fatal disease: diminishing return. 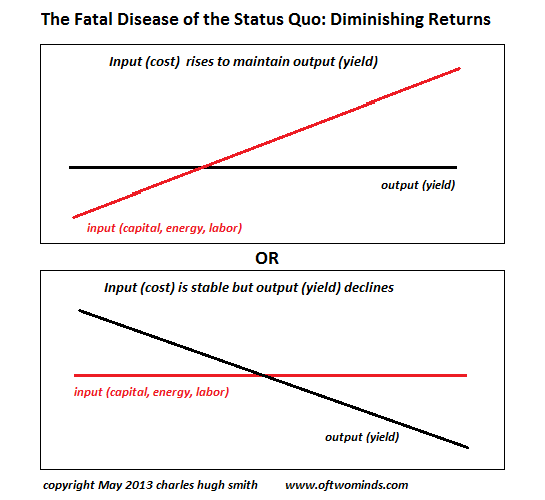 The basic idea of diminishing return is closely related to marginal utility and marginal return: the more capital, energy and labor committed to a project, the lower the return/yield/output. 1. Output (yield) remains stable, but it requires an ever-increasing input of capital, energy and labor to maintain that output. 2. Input remains stable but output (yield) constantly declines. To survive, the Status Quo must maintain the same output: the stock market must be held aloft at current levels, entitlements must be paid, the National Security State must either expand or maintain its current global reach, and so on. What's hidden from view is the rising input costs to maintain this illusion of stability. Consider the Federal Reserve's campaign to elevate the housing and stock markets. First the Fed need only threaten to buy mortgages and Treasury bonds to trigger a market rally. But soon this is not enough to keep the market aloft, so the Fed unleashes a campaign of quantitative easing (QE1) with an eventual end date. This pushes the market higher, but once the artificial stimulus ends, the market feels gravity once again and rolls over. To maintain the necessary output--a rising stock market--the Fed must increase each dose of QE. But the return on this ever-increasing input diminishes. Like an organism fed a stimulant, markets habituate to the artificial stimulus and quickly become dependent on ever-increasing doses to maintain the output (i.e. the "high"). In 2012, the Fed announced essentially unlimited QE to infinity. 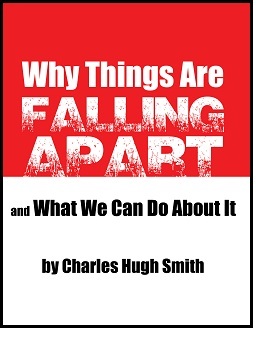 There can no longer be any hint of an end to the quantitative easing, or the output (the market) will fall off a cliff. That's the problem with diminishing return: eventually the input is so costly the system implodes. The Fed has already injected the patient (the economy) with massive doses of financial crystal meth to maintain the stock market's "high." Unfortunately for the Fed, the market demands a bigger dose to keep the high going, but the larger dose will prove fatal. Illustrating the other mechanism of diminishing return is the Higher Education Cartel, one of the monopolistic rentier arrangements that dominate our economy (banks, the mortgage industry, national security, healthcare/sickcare, etc.). 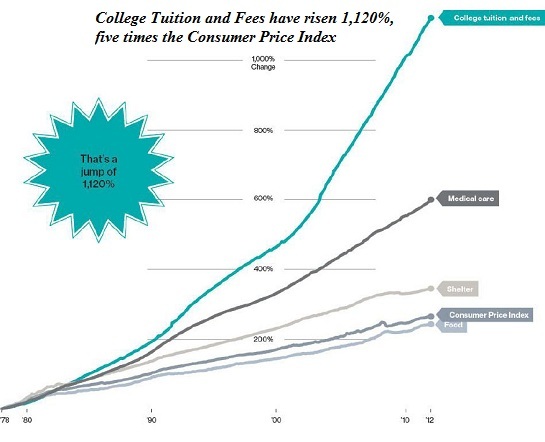 Even as the cost of attending college have skyrocketed by 600% (adjusted for inflation), the output--the value of that education--has declined. A recent major study, Academically Adrift: Limited Learning on College Campuses, concluded that "American higher education is characterized by limited or no learning for a large proportion of students." The Educrat Industry blames the economy for its own abysmal failure to actually provide a measurable yield on the immense sums spent on higher education, of course, but the reality is that higher education fails to prepare students for work in the real economy. What higher education excels at is maintaining an ever-increasing input of cash while its output/yield declines. the same is true of all the other fiefdoms and rentier arrangements that dominate our economy. The input needed to keep the Status Quo stable must be taken from other potentially more productive investments. Taxes notch higher as the state scoops ever greater sums into its maw to fund its failing fiefdoms and diminishing-return cartels, and it borrows trillions of dollars to fill the gap between tax revenues and ever-rising input costs. All that borrowed money has a cost, too, of course--interest. The costs of maintaining a sclerotic, cartel-state Status Quo infected with incurable diminishing returns eventually exceed the carrying capacity of the real economy and the Status Quo collapses in a heap. Thank you, Mary S. ($25), for yet another wondrously generous contribution to this site -- I am greatly honored by your steadfast support and readership. Thank you, HUbert G. ($5/month), for your most excellently generous subscription to this site -- I am greatly honored by your support and readership.